Whether this is a good thing or bad, my little one is all grown up now and she’s in Grade 1 *sniff*. She keeps saying Mama I’m big now, I can do it, I know how to do this etc. I always think that she’s always in need of my help, like constantly but it’s the total opposite. From now on, I should start to learn/coach myself how to give her her freedom, her own space to explore and experiment. I know it’s tough but I have to do this so she can be an independent woman. I work in a school where Primary & Intermediate stages are combined so I transferred her to my school. 1st day was tough on me not on her, I kept watching her from far away and crying my heart out like a baby in need of his mother. I just couldn’t comprehend that she’s old enough to take care of herself. She felt lost at first but then she continued her day normally making a group of friends and playing with them in her break. Almost a month ago, exactly on March 4th 2018, at 04:04 pm, I was blessed with a baby boy Abdelaziz. I couldn’t express my feelings when I saw this little one, overwhelmed with many emotions which I cannot put in words. I can’t lie to you, the feeling were very different than when I saw Jana. Jana was in an incubator for a couple of days and I was in a lot of pain after my c-section. But with Abdelaziz, we connected immediately and I was able to hold him after a couple of hours. Still, Jana will always have that special place in my heart for she is my first child, my one and only. Abdelaziz will also have that special place in my heart, for he came after 5 years and a half, he’s my one and only. Everybody kept nagging on my head to register Juju in a pre-school but I’ve always been hesitant or afraid of keeping her with people I don’t know. I kept on wondering, how will they treat her, feed her or clean for her. I mean these are the most important things that every mother care about and I didn’t want to worry about them all day. BUT I convinced myself that it’s time for Juju to go to school because she started to become shy & she wasn’t like this before and also get scared of some strangers. I dropped Be A Bee Preschool a visit which is located in Hitteen (near our house) and got to meet the ladies in charge & Juju’s soon-to-be teacher Miss Ama (American). They explained everything to me, the curriculum, things she’ll be doing, trips she’ll be going to, open days, what she’ll start to recognise (like her name) and so on. Also they’ve told me that they offer 2 meals for the kids (Breakfast & Lunch), they even gave me the menu. They change for the kids and keep them clean all the time. The whole place is monitored by cameras and the screen is in the entrance so that every parent can come in and check on his/her kid anytime. I didn’t have a reason to say no, so I registered Juju and the big day came. 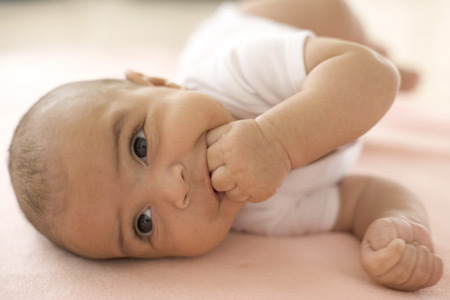 Having a healthy beautiful child is an amazing blessing from Allah. Baby Jana is the best thing that has ever happened to me after I’ve lost my dear mother 9 years ago. Everyday I wake up thanking god for what I have. I’m trying to be the best mother for Jana and I want to make her happy all the time. Whether to take her out, buy her new clothes or toys, playing with her or even telling her bed time stories. And giving her the best birthdays ever. 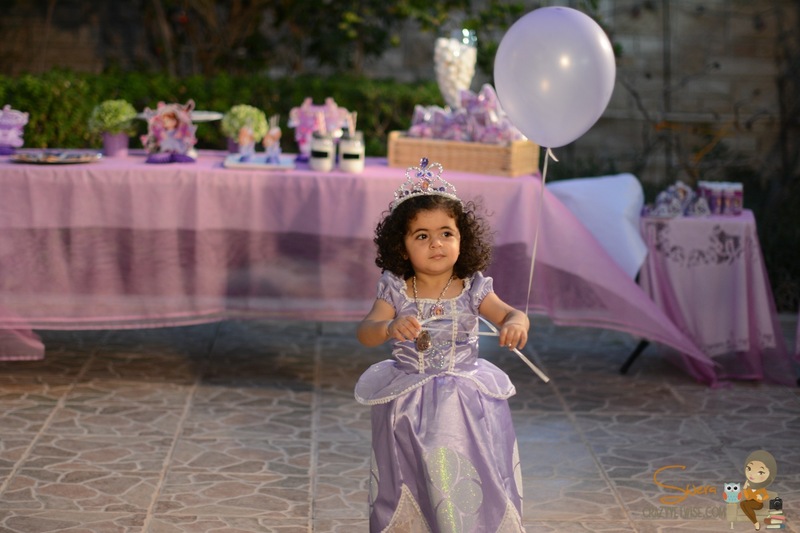 I ordered Sofia The First Party decorations from a website and they were delivered within 10 days, then I got to think of the setting. I chose my grandparents yard which is huge and a good location for taking pictures. After that I got to prepare the setting of the tables. I went to Caramel and ordered and 2 tiers special cake that matched the theme of Sofia and cake pops and cookies from Luscious. I went to Hawalli to get other kinds of decorations and purple fabric to cover the tables. On the day of the party, we started getting the yard ready for the celebration. Everything screamed Sofia ❤ I’m in love with this elegant and feminine princess. Lanterns, balloons, confetti and so many things hanging on the ceiling. The DJ people came to set their stuff and everything was ready by 5:30 pm. Imagine working from 11 am tip 5 pm in a very humid weather. I couldn’t breath after the party finished but i didm’t feel a thing while the kids were dancing and having fun. People started arriving around 5:30 pm and the fun started immediately. All the girls wore Disney princesses and they looked so adorable ❤ They loved and enjoyed everything even though the wether wasn’t helping. my dear Juju was enjoying her day to the max, dancing and playing around. She wasn’t keen on playing games with the other girls, maybe because she’s too young to understand winning competitions and games but she loved playing with Sofia stuff that were every where. The time came for Juju to blow her 2nd birthday’s candles. Everybody was singing Happy Birthday but Jujus was in another place, eating her marshmallow pop and smiling 😛 The cake was so delicious yum yum. All red velvet and dark chocolate. My sweet Baby Jana, I hope one day I’ll see a grown up woman full of beauty inside and outside. Successful and smart. Married and have beautiful kids. Amazing career and life. I love you mama and I wish you all the best. Last week, I received an e-mail from a lady introducing me to her home business which is a Kuwaiti Baby Album called Thikrayati (My Memories). I instantly fell in love with it and with all the details it had. I ordered one for Juju because still I didn’t arrange Juju’s pictures in albums and this was the perfect one for certain memories. It’s been 2 weeks since Maya left to her home town to fix some problems she’s been having over there & she’s supposed to come back on the 1st of June, before Ramadan. I hope/pray that she will come back on time & won’t do the usual thing (ignoring us & staying home). I know I don’t work but taking care of Baby Jana is a 24/7 job,literally. I don’t let Maya touch her at all (well, only if she wants to play with her while she’s on the ground or in her bed). I do everything, feed her, change, bathe her, play with her & keep an eye on her all the time. no one can really comprehend the stress & energy babies cause to their mothers unless you’re a real mother & by that I mean taking care of your baby all by yourself without relying on your maid (if you’re a stay home mom). I’m also trying to manage my blogging life (YES, I LOVE BLOGGING, ATTENDING EVENTS & SO. Leave your hateful comment to yourself haters coz they won’t affect me & I will continue blogging until I decide to stop, NOT YOU). Blogging has become an addiction to me. It’s fun, gives more experience in life & how to handle/deal with people/things. It’s making me more social & it’s showing me the good people from the bad. I’m loving it. But the thing is, when the night comes, I become very exhausted. Even when I stay home & don’t go out or do anything at all (yup, on gloomy days I ignore some chores). And sometimes I don’t feel like getting out of bed & that becomes more stressful when Juju wants to play & have fun. She’s becoming more active these days mashallah & wants to move all around the place or go outside just to look at the cars passing by. The Horror movie I may face the next week or so is when I start working. Yes, I may (not sure) start work within few days. That wasn’t expected at all but suddenly the Ministry of Education wants to recruit me now when they’ve told me more than once that I will start work on September *cries*. I’m a bit excited (Hello Salary) but at the same time stressed & worried. What will I do without Maya? How will I handle Juju & the house at the same time? I know it will be for a short period of time but it’s gonna be really hectic. Believe it or not, when Baby Jana was 3 months old, she started rubbing her gums with her fingers, placing 3 fingers in her mouth 😛 and sometimes crying with no reason at all. My grandma told me that she’s teething, I didn’t believe her coz it was too early, but she explained that it takes time until the 1st tooth is out. When she was 4 months & 3 weeks old, I felt a sharp thing in her gum,,,I start peeking & voila, it’s the tip of her 1st tooth coming out 😀 I got so excited and started calling everyone “Juju got her 1st tooth” and it’s not even out completely. I couldn’t see it because it was still not even that out, but when I touched her gum, I felt it. I’m giving her Kreuter’s teething gel & Adol at night only, the Dr. said do not let her body get used to medication. Some nights we enjoy a calm peaceful sleep & sometimes it’s the total opposite. 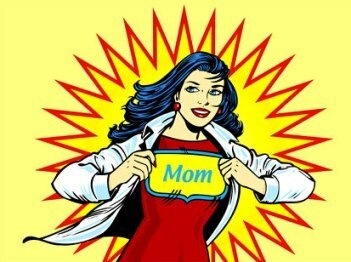 Yes, I’m very tired & exhausted, good thing that I won’t start my job these days because I won’t be able to handle it ,,, God bless working mothers who are coping with this at night & waking up in the morning to go to work & face the samething when they come back home! This is only the 1st tooth ,,, they say it gets worse when the others come out! Juju is getting bigger mashallah & her Moses basket is becoming small for her size. It hit me that It’s time for Juju to sleep in her room because there’s no place in our bedroom to bring her babycot. 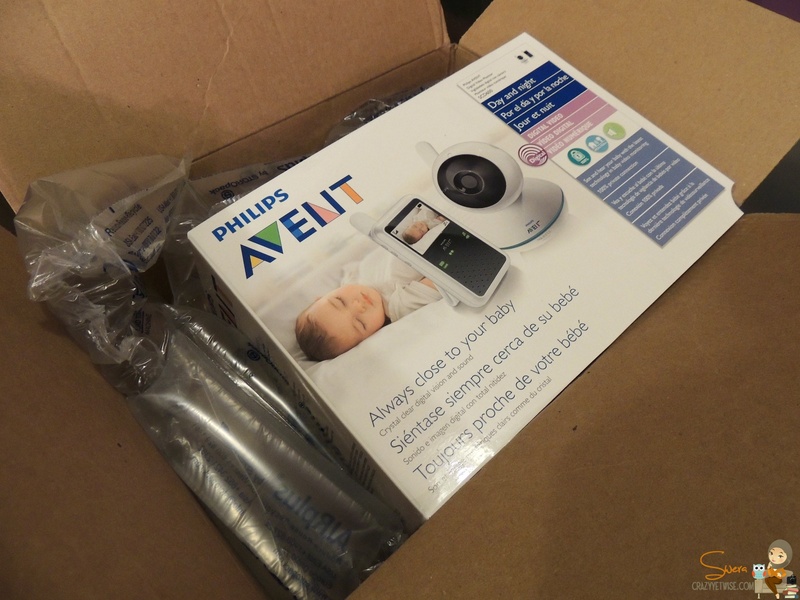 The only solution was to get a baby monitor, my favorite brand is Philips Avent. The monitor is available at Mothercare & costs KD 120 which is a total rip off! WHY? Coz I got it from Amazon + Shipment + Customs fees for only KD 60. The device was very very easy to use, just charge it, place the batteries in the camera & voila, it will start working. Place the camera in a good location & get your monitor by your side where you can sleep in peace. If you’re wondering about the radiation, it’s very safe to use as long as you’re placing the camera 20 cm away from your baby’s body, and this device has been tested & meets the FCC RF exposure guidelines. That day I was reading an article by Samah in Zafaf Magazine about how the 1st baby affects the life of the parents. Indeed, it does affect the life of the couples, sometimes or most of the time it has a negative effect. You see, whatever you read or attend lectures about what to expect the 1st year from your baby, trust me, it won’t do you any good. You’ll have some info on how to deal with some of the situations you’ll encounter, but mentally & physically you’ll still feel that you’re not ready, & don’t forget the depression phase. Mine lasted only 10 days, it was horrible but thank god it ended, but it tends to stretch a bit longer with others. Best of luck to the moms to be or the ones who just gave birth …. You’ll get irritated from your baby for 10 minutes but you’ll be over the moon when he/she smiles, make a new sound or a new move. They’re a great gift from Allah. Almost 2 months are gone now & life is becoming more & more beautiful with her full of funny moments & frustrating ones as well. As you can see in the picture above, she has grown mashallah. 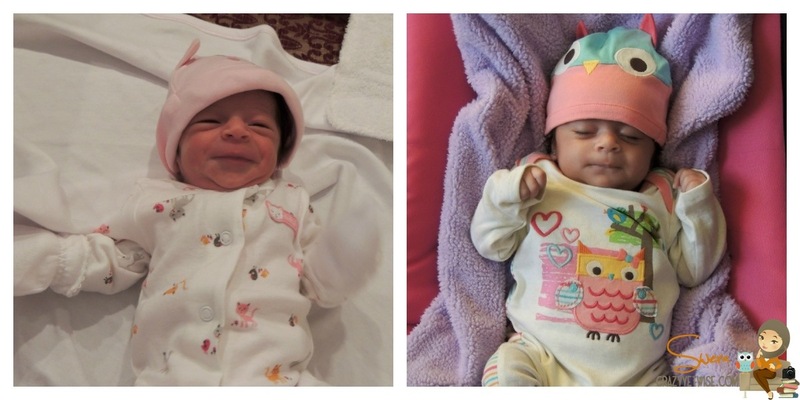 She was very very tiny when she came out early to this world, but now she’s getting bigger & taller mashallah. Her face is changing every day, one day she’s cute & adorable & the other day she looks OMG 😛 but thats very common with newborns. Dealing with baby Jana is becoming easier el7mdellah. She has picked a routine on when to sleep/feed. Now, that she’s a lil bit bigger, I can carry her, change & play with her without being worried that I might break a bone in her. She started smiling, & making voices (ya5ty). Now, my blogging life & Baby Jana is a hassle … Attending events, openings, restaurants ,,, etc is very difficult when you have a newborn. As I said before, I don’t trust maids with my baby, so finding someone from my family to babysit at certain hours was a hassle … I have my grandma, she’s a sweetheart & very helpful, sister, & father. Yup, my dad knows how to baby sit (bs marrat yetwahag 😛 ) I tried husband once & I had to cut trip (running errands) & come back home. That happened alot. I love blogging alot, it’s the only thing keeping me sane along with Baby Jana 😛 It’s making me more relaxed, extra happy & giving me a piece of mind from my busy life. But I’m turning down alot of invitations coz sometimes it’s not in my hands. Baby Jana comes 1st & then my blog. Thank you Allah for all your blessings. 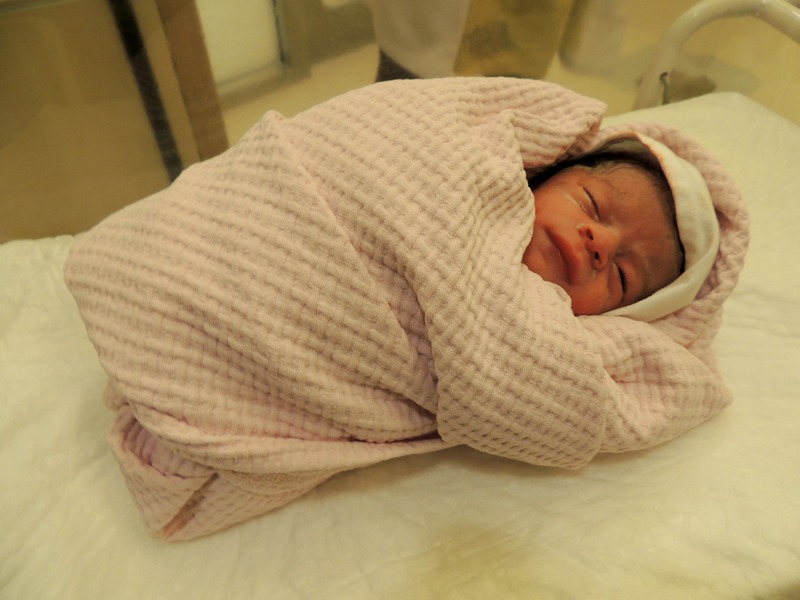 My sweet little tiny baby girl was born on the 5th of Oct 2012 around 5:25 pm … I had some complications & had to go with C-section to get her out (another post will follow about my delivery at Alseef hospital). I woke up in pain & feeling dizzy … started mumbling some stuff & started saying sm words to my family members who were there! Of course they started laughing at me 😛 …. They showed me her picture that they took when they showed her to my family & honestly I got scared … I mean, she looked so tiny, small, & short. She looked really scary. Next morning, I asked for her, & they told me that I have to go to NICU & see her. What’s NICU? Neonatal Intensive Care Unit. My heart started beating & I got terrified, smth is wrong with my baby. They assured me there’s nothing wrong with her except that her weight is below average & she has to be under observation. I just started walking, & I’m telling it was really painful but I didn’t care about the pain because I was dying to see her … She was sooooo thin & tiny but healthy el7mdellah! I returned home 2 days later & the big action started … When I was in the hospital, people were taking care of me, but when I got back home I had to take care of a very fragile baby, not to mention taking care of myself. Thank god my sister took 2 weeks off from her work & was there to help me through this tough phase. Staying up all night long feeding her every 2 hrs, & snoozing while doing it lol 😛 Not being able to sleep properly because of the wound. Getting up/off the bed was really really painful you can’t imagine the pain. & I had to get myself up every now & then at night to feed her … It was really exhausting & painful but worth it. Talking about “me time” … dream on new moms 😛 I have to find some one to watch her so I can take a quick shower. I check social media networks through my phone for a couple of minutes. Only today, I was able to open my laptop, write a post & arrange some of my baby’s pictures 🙂 me time is no longer mine …. The wound started to heal, pain is becoming less now & I’m able to sleep properly like an hr every 4 hrs 😉 my body started coping with the little amount of sleep. I dunno about the depression, when will it go away, but I’m hoping soon nshallah!